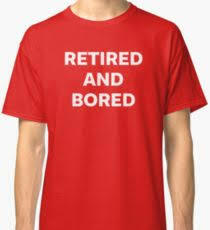 Recently I spent a very enjoyable lunch with some retirees. When time came to “sing for my lunch” I extolled the virtues and pleasures to be enjoyed from planning your time through retirement, the best years of your life. At question time, the subject of boredom and depression in retirement was raised. I am afraid that my knee jerk reaction was to identify a lack of planning as one major contributing factor to this phenomenon. On further consideration, I realise that, often, depression has a clinical or psychological source, which acts against a willingness to take any positive action. This, in turn, leads to a lack of purpose, which …. and the wheel goes on its way round and through life. I firmly believe that wandering through life without purpose will inevitably lead to both boredom and depression. Which comes first is irrelevant, they both lead eventually to the same wasteful end. If you find yourself depressed and without purpose then, I suggest, you need to spend some time analysing why you feel this way, and then sort a plan to address and resolve the situation. If you find this impossible, then I suggest you seek professional advice. I would, however, only look outside myself once I have exhausted the self-healing analysis and resolution plan. Boredom and depression are common symptoms of unhappiness, often brought on by loneliness, and can only be solved through positive action on the part of the sufferer. To me, immediately seeking outside assistance is the easy way out and, as with most things in life, will cost you a lot of money with potentially limited long term benefit. I would use outside support only after trying personal examination and analysis without success. Depression is, in my opinion, born from the same parents as boredom, and is often similar in description but more intrusive in action. Through my life, I have experienced periods when I have felt lonely in my journey against insuperable odds. My most effective response during this time was to remember that old-fashioned mantra “laughter is the best medicine”. I determined to try it out. I set my objective as “make at least two of the people I encountered each day laugh”. This meant making contact with people I had never met and did not know, I just needed to make people happier and laughter was the measure by which I achieved this. I succeeded and found that, when I make people laugh I simply have to laugh along with them and, hey presto, this seemed to both lighten my load and offered relief to others. I feel that there is no better solution to the problem than through the blessing of laughter – even if it is at my own expense. I rationalise this comment by asking myself why I am so important and valuable that I cannot become the object of laughter – if I do I must surely be providing others with light relief and a boost to their day. Smile and laugh at yourself, and with those you love, respect and hold dear. Never forget that “when we laugh we laugh with others, when we cry we cry alone”. Now go and enjoy what life throws at you – if you look hard enough you will find humour therein.